DUT Drama Studies presents its seventh annual isiZulu production, USiza - an adaptation of Shakespeare’s great tragedy, Julius Caesar at the Courtyard Theatre running from March 1 to 8, 2019, under the direction of Siza Ka Mnisi Mthembu, with choreography by Mdu Mtshali and translated into isiZulu by Sabatha Ngcobo. DUT Drama keeps the tradition of Shakespeare alive by consistently interrogating the playwright’s universal and timeless writings and enduring themes in regular contemporary and new productions which have toured internationally and have been staged in English and isiZulu. This adaptation is set somewhere in South Africa, using the fractious political context of our country as a worthy backdrop to the drama. 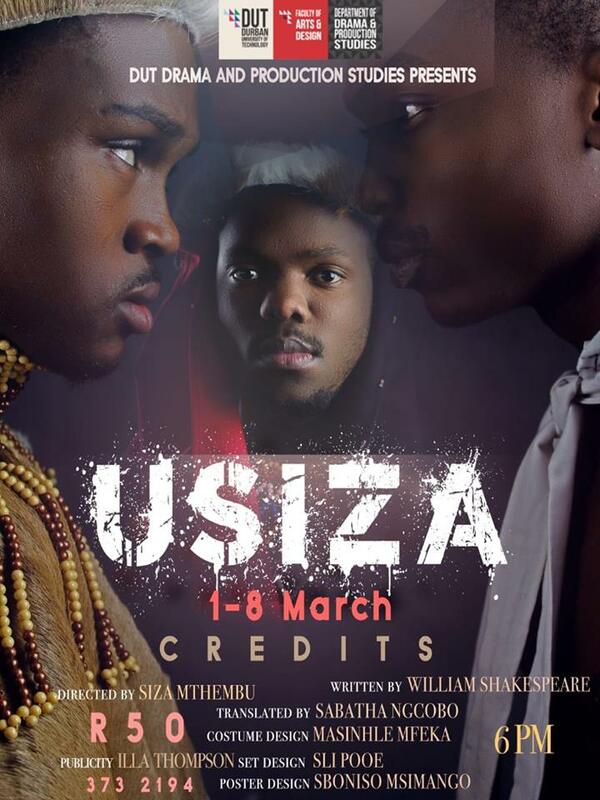 USiza runs at the Courtyard Theatre, Durban University of Technology from March 1 to 8 nightly at 18h00 Advance bookings can be made through Busisiwe Mqadi on 031 373 2810 / Busisiweem@dut.ac.za – or tickets can be purchased at the door.